A new multi-institutional graduate program will help students learn how to create human tissue with 3D "bioprinting." Once they've completed their studies, the students will hold a master's degree from two institutions, one European and one Australian. The new master's in biofabrication is the first in the world in which students will study the technology involved in creating tissue. It encompasses multiple disciplines: chemistry, physics, biology, medicine, robotics and computer science. 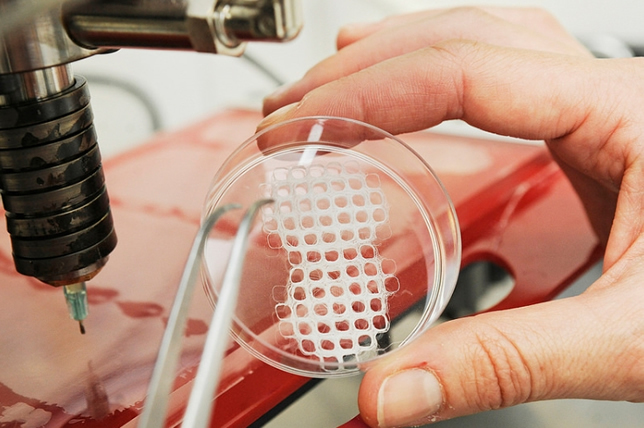 Biofabrication is a process by which scientists generate human tissue using 3D printers. While the human body is unable to replace complete organs, the science of biofabrication can help repair organs and replace lost tissue by combining the production of 3D printing with biological components to construct engineered tissue that can be used in regenerative medicine research and therapy and medicinal products. The program will begin in September 2015 at four institutions: the University Medical Center Utrecht in the Netherlands, the University of Wurzburg in Germany, Queensland University of Technology and the University of Wollongong, both in Australia. The students will spend their first year studying at their home campuses. Then, for the second year, they would transfer to a different continent and complete their studies there — Australian students in Europe and European students in Australia. "The universities will each admit 10 students to the degree who will graduate with a multidisciplinary outlook and expertise which would be welcome anywhere in the world," said Professor Dietmar Hutmacher, who leads Queensland's biofabrication research.